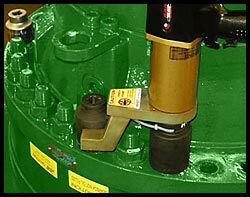 RAD Nutrunners offer Battery Multipliers, Electric and Pneumatic High Torque Nut runners. RAD nutrunner are Lighter, Faster, Smaller and tougher than any other. RAD Pneumatic Nutrunner: the reliable solution to speed up common maintenance & shutdown bolting applications. The RAD Air Nutrunner wrench offer dependable solution for controlled bolting. A "stall type" tool with no impacting, smooth continuous application of power, complete elimination of destructive hammering and reducing operator strain resulting in increased productivity. 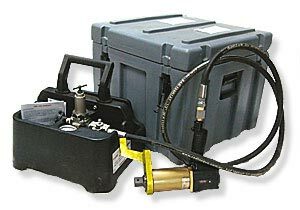 RAD Pneumatic NutRunners use an REGULATOR & LUBRICATOR between the Tool and the air supply with adjustment valve, inside a tough plastic Cradle that holds the Tool, impact sockets & Torc Chart. An adjustable Air Regulator which Sets the PSI and Controls the final output. Tough plastic cradle for protective easy transport and setup. Heavy Duty plastic shipping case which is Lockable and Weatherproof. 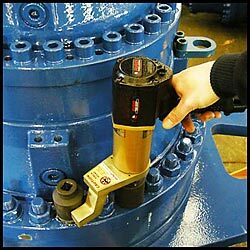 RAD Pneumatic torque nutrunner tools are Lighter, Faster, more compact and tougher. We invite you to test drive RAD Pistol Grip wrench today with a Demostration on your application. Built in Canada, the RAD nutrunner tools are quiet and offer 88 times less vibration than impact guns. 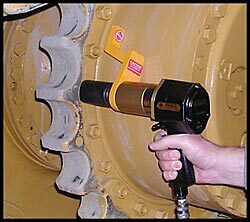 Popular nutrunner for Mining machine maintenance on Caterpillar, Komatsu, and on Pipe flanges in petrochemical. Perfect with Lokrite Backup nuts. RAD pneumatic Nutrunner offer adjustable controlled torque. This air wrench is ideal for screwing pullers & wheel nuts, both tightening and loosening bolting. These pneumatic nutrunner tools are non Impacting and provide adjustable torque settings. 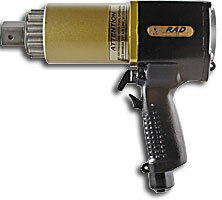 RAD Air Torque multiplier, are ideal for wheel nuts with long nose attachments. 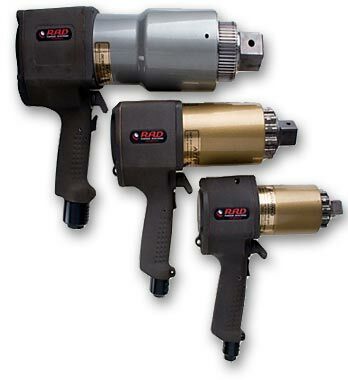 These Air guns are set via a regulator with torque accuracy of + or - 5%. Multipliers should always be used with Impact Sockets. This Nutrunner can be specifically set up with nose extensions to suit Cat & Komatsu truck wheel nuts & Track Presses or master link bolts on Dozer Tracks. Torque range of 150 ft-lbs. to 8,500 ft-lbs. A total NutRunner hire solution! Our Nutrunner tools hire with AIR REGULATOR & LUBRICATOR, hoses, Impact Sockets & torque charts. 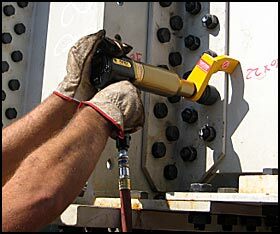 These high torque wrenches deliver powerful, accurate & safe torque load. These lightweight and ergonomic hand held pistol grip tools are used in industries worldwide. For air nutrunner tools there are different types of reaction arms to add to the tools usability. Deep Reaction Arms are common for applications unable to secure a reaction using the standard arm. 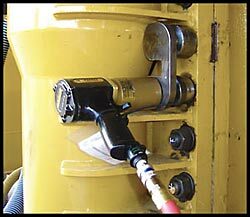 Pneumatic Wrench Applications like Dozer Tracks, Bridges, Mill Liner bolts and Crushers are some. PLUS Extended Noses fit direct to the nutrunner Square drive allowing access to bolts deep within a wheel rim, such as heavy earthmoving equipment wheel nuts.